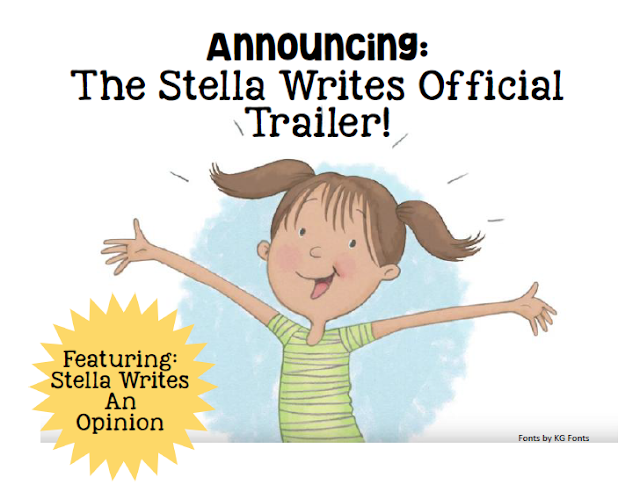 If you follow my blog, you already know about Stella Writes. What you don’t know is SDE and I have been working to create a Stella book trailer. And, here it is! It's delightful to see Stella in all her animated glory! Naturally, SDE and I hope the book trailer will serve to spread the word about Stella much further. We want more teachers to get a sense of what these unique resources have to offer student writers-- how they can lift their motivation and help them develop competence and confidence for each text type via the engaging modality of a picture book. We hope more teachers and students will fall in love with and want to work alongside our writer-extraordinaire: Stella! Please help me spread the word by sharing the link to the trailer with anyone you know who teaches young writers (K-4). Thank you so much! I would appreciate any feedback you have on the purposes you think the book trailer could serve. Is this something you see could be useful to view with students (in whole or in part)? If so, why? Are there other ways the trailer might be used? I envisioned the audience to be teachers, but I’m curious to hear your thoughts. I'm thrilled and appreciative for the work of SDE (Staff Development for Educators) and Tom Schiele in producing this video. A HUGE thank you to Carly Storro (a high school senior) for capturing Stella so perfectly! Great! Thanks for sharing the information. Your site has a lot of useful information for myself.